In JG Ballard’s novel, Concrete Island, an architect is left stranded after a car accident in an area of overgrown wasteland in the middle of intersecting motorways. 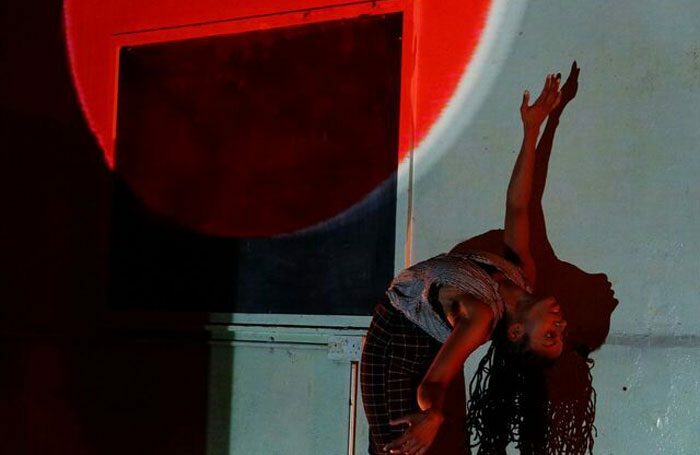 In Void, a contemporary dance adaptation of Ballard’s novel, the architect is portrayed by a black female dancer, Mele Broomes. A programme note explains that this nowhere space is meant as a place where she becomes a fugitive, isolated from the world and permitted to empty herself of socially inherited racial trauma. In practice, Broome’s race doesn’t necessarily read as significant, though there is obviously some form of transformation happening – she jerks and writhes on the floor for most of the show, or attempts to climb the ring fence which ominously walls the back of the space. At one point she is consumed by a womb-like bin bag before clawing her way back out. What’s most striking is the sensory overload of it all. Lit by Dav Bernard solely with glitching projection – irregular blocks of colour flashing by like passing 18-wheelers – and accompanied by a relentless, noisy dronescape, it leaves you barely a moment to catch your breath. Though some might find the sheer aggression of it thrilling, to me it was oppressive, stressful and lacking an emotional hook to cling to.